Some time ago Cisco's IOU was leaked out to the web. I was able to get a copy (don't ask where, I won't help you) and have managed to get it set up on a spare box at home. 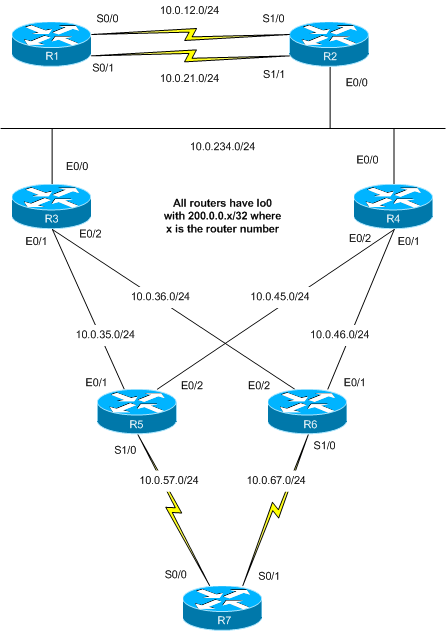 There are a couple of really good tutorials on the Web that explain how to get it set up and working and how to build a lab topology. I've built two topologies so far that I use to lab things up when needed, and I'd like to share the first with you now. To create a topology in IOU you define how devices connect to each other via a NETMAP file. If you want more details on how to build a NETMAP file you can head over to Google and search for it. Here's a diagram I did up for this topology, Note that the addressing is my own and that you are free to use anything you configure yourself. Since I'm not providing any base device configs you are on your own here. I don't actually use this topology very much. I built another that is far better suited to my requirements and I'll be posting that one shortly in a follow up post. If you like this and use it let me know. I'd love to hear about it. Can you load initial configs like dynamips into IOU? Correction on that. If you look at the help there's a switch to load a config file when you start the router. It's -c.
hey how do you differentiate between a router and a switch in the IOU NETMAP file? You don't. It's irrelevant really. The NETMAP only describes which interfaces connect to which interfaces for specific IOU instances. Which IOU image you start up for that instance determines if it's a "switch" or a "router". This topology doesn't use L2IOU, but if you look at my IPexpert IOU topology you will see that I've used L2IOU for some devices, and IOU for others.